O God, who brought Saint Louis from the cares of earthly rule to the glory of a heavenly realm, grant, we pray, through his intercession, that, by fulfilling our duties on earth, we may seek out your eternal Kingdom. Through our Lord Jesus Christ, your Son, who lives and reigns with you in the unity of the Holy Spirit, one God, for ever and ever. O God, who adorned the Priest Saint Joseph Calasanz with such charity and patience that he labored tirelessly to educate children and endow them with every virtue, grant, we pray, that we, who venerate him as a teacher of wisdom, may constantly imitate him, for he was a co-worker of your truth. Through our Lord Jesus Christ, your Son, who lives and reigns with you in the unity of the Holy Spirit, one God, for ever and ever. O God, who have prepared for those who love you good things which no eye can see, fill our hearts, we pray, with the warmth of your love, so that, loving you in all things and above all things, we may attain your promises, which surpass every human desire. Through our Lord Jesus Christ, your Son, who lives and reigns with you in the unity of the Holy Spirit, one God, for ever and ever. St. Louis IX, (1215-1270) who became King of France at the age of twelve, had been religiously brought up by his mother, Blanche of Castile. Throughout his life he remained deeply devout and as a king his conduct was that of a real saint. He devoted himself to the affairs of his kingdom and to those of Christendom and was a great peacemaker — kings and princes constantly sought his aid in settling disputes. He was humble and upright, helpful to the needy and in person nursed lepers and the sick. St. Louis gave to all the example of a life overflowing with charity and sovereign justice. He was a tertiary of the Order of the Holy Trinity and Captives (the Trinitarians) and a strong supporter of the Franciscan Orders and other mendicant orders as well. A full decade before he died in Tunis, in honor of the King's support and Catholic manner of life, St. Bonaventure proposed to the Franciscans' General Chapter that suffrages be prayed for the King annually (essentially a Feast Day, as for those already sainted! ), the the Chapter approved the proposal three years later. Immediately after Louis IX's death, the Franciscans began an active campaign for his canonization, and he was venerated by the Secular Franciscan Order and the Third Order Regular as protector and advocate as soon as he was canonized. He died near Tunis, lying on a bed of ashes, during a crusade for the deliverance of the Holy Land. St. Joseph Calasanz (1556-1648) was born in Petralta, Aragon, and died in Rome. He studied law and theology and was ordained a priest in 1583. He always showed a great interest in the religious instruction of children, especially of those who were poor and neglected. He journeyed to Rome, became a member of the Confraternity of Christian Doctrine, and opened a free school for the education of homeless children. In 1602 he founded the Order of Piarists who were to continue this charitable work among youth. According to the 1962 Missal of St. John XXIII the Extraordinary Form of the Roman Rite, St. Joseph's feast is celebrated on August 27. 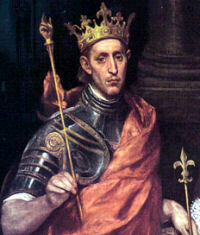 Reigning from 1226 to 1270, Louis IX showed how a saint would act on the throne of France. He was a lovable personality, a kind husband, a father of eleven children, and at the same time a strict ascetic. To an energetic and prudent rule Louis added love and zeal for the practice of piety and the reception of the holy sacraments. He was brave in battle, polished at feasts, and addicted to fasting and mortification. His politics were grounded upon strict justice, unshatterable fidelity, and untiring effort toward peace. Nevertheless, his was not a weakly rule but one that left its impress upon following generations. He was a great friend of religious Orders, a generous benefactor of the Church. The Breviary says of him: "He had already been king for twenty years when he fell victim to a severe illness. That afforded the occasion for making a vow to undertake a crusade for the liberation of the Holy Land. Immediately upon recovery he received the crusader's cross from the hand of the bishop of Paris, and, followed by an immense army, he crossed the sea in 1248. On the field of battle Louis routed the Saracens; yet when the plague had taken large numbers of his soldiery, he was attacked and taken captive (1250). The king was forced to make peace with the Saracens; upon the payment of a huge ransom, he and his army were again set at liberty." While on a second crusade he died of the plague, with these words from the psalm upon his lips: "I will enter Thy house; I will worship in Thy holy temple and sing praises to Thy Name!" (Ps. 5). It was his mother's supreme desire that her son should become a kind, pious and just ruler. She was wont to say to him: "Never forget that sin is the only great evil in the world. No mother could love her son more than I love you. But I would rather see you lying dead at my feet than know that you had offended God by one mortal sin." These words remained indelibly impressed upon his mind. St. Louis was a member of the Third Order of St. Francis and so is included in the family of Franciscan saints. Patron: barbers; builders; button makers; construction workers; Crusaders; death of children; difficult marriages; distillers; embroiderers; French monarchs; grooms; haberdashers; hairdressers; hair stylists; kings; masons; needle workers; parenthood; parents of large families; prisoners; sculptors; sick people; soldiers; stone masons; stonecutters; tertiaries; Archdiocese of Saint Louis, Missouri. Symbols: Crown and scepter tipped with a Manus Dei; crown of thorns; fleurs-de-lys; three nails; banner with fleurs-de-lys; three crowns at his feet; king holding a cross or crown of thorns. Learn about the origin and meaning of the Fleur-de-lis. St. Joseph is the founder of the Poor Clerks Regular (Piarists), a community devoted to the task of educating youth. At an early age Joseph loved to care for children; he gathered them together, conducted religion classes in boyish fashion, and taught them how to pray. After a time of severe illness he was ordained a priest. His zeal found expression as he organized the Order of the Poor Clerks Regular of the Mother of God of the Pious Schools and directed the members in the instruction and rearing of children from poor parents. While residing in Rome, Joseph endeavored to visit the seven principal churches of that city almost every evening, and also to honor the graves of the Roman martyrs. During one of the city's repeated plagues a holy rivalry existed between him and St. Camillus in aiding the sick and in personally carrying away for burial the bodies of those who had been stricken. On account of his heroic patience and fortitude in the midst of trouble and persecution, he was called a marvel of Christian courage, a second Job. When eighty years old, he was led as a criminal through the streets of Rome by the Inquisition. His life is a consoling example of how God permits misunderstandings and opposition, even from ecclesiastics, to harass noble undertakings. At the time of his death his Order had almost been destroyed. Then, however, it again began to flourish. Patron: Colleges; schoolchildren; schools; schools for the poor; students; universities. Learn more about St. Joseph here and about the order he founded.